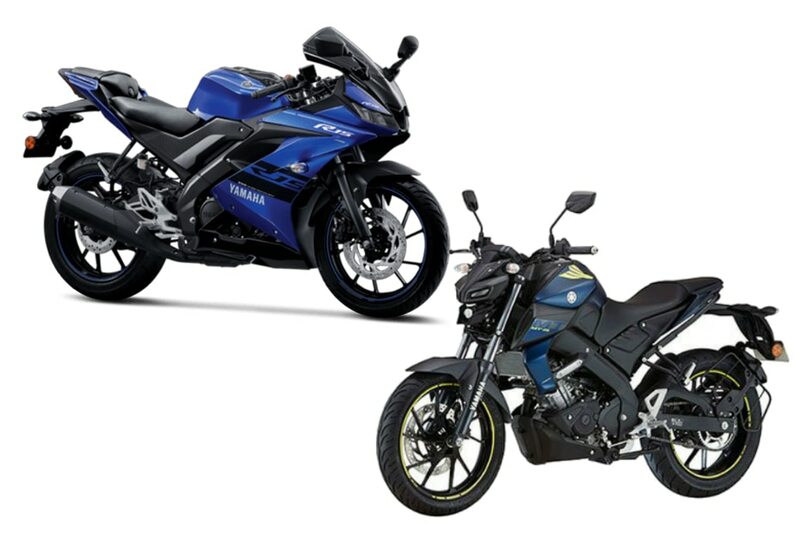 HomeNew BikesBike NewsYamaha MT-15 Or R15 V3.0: Which One To Buy? It’s sibling rivalry at its best with just Rs 3,350 separating both the bikes. Which one should you buy? We help you out. What does the Yamaha MT-15 offer over the R15? The MT-15's upright riding position, for one, is far more comfortable than the R15’s committed riding position that's great on the racetrack but painful everywhere else. Also, the MT-15’s 810mm seat height is 5mm lower than the R15 and it’s also slimmer, which makes it more accessible and easier to manage. The MT-15’s footpegs are set forward and lower and makes for a more comfortable riding position. Both bikes get tiny pillion seats, which is surprising since the MT-15 is supposed to be a street bike. Its saving grace here is the fact that the pillion seat is easier to access than the R15 and the ungainly grab handles are actually quite useful to hold on to. What is the MT-15 missing out over the R15 V3.0? Both the India-spec MT-15 and R15 miss out on upside-down forks which its international-spec counterparts come with, and instead make do with conventional forks. However, while the R15 gets dual-channel ABS and a cast aluminium swingarm, the MT-15 instead gets single-channel ABS and a box-type swingarm. Here, the MT-15’s low-cost box-type swingarm does not make much of a difference in handling, but the fact that it hasn’t done much to reduce costs is just plain sad. Yamaha going with the choice of a less safer ABS option isn't right especially when the cost difference between the single channel ABS-equipped MT-15 and the dual-channel equipped R15 is just Rs 3,500. For comparison, the difference between the non-ABS and single-channel ABS-equipped KTM Duke 200 is Rs 8,200 while the non-ABS and dual-channel ABS equipped Yamaha FZ25 is Rs 14,000. So we can expect a price cut of at least Rs 5000-6,000 just for opting for single-channel ABS over dual-channel ABS. The MT-15 we rode on the track also had poorer feel than the non-ABS R15 we reviewed a while back. Also read: New MT-15 vs Used KTM 390 Duke: Which One To Buy? While the R15 V3.0’s plastic and panel quality felt lower than its earlier versions, in terms of quality, the MT-15 feels even worse than the R15 V3.0. Even the switchgear quality feels a notch lower than that of the R15 V3.0. So what are you losing on the MT-15 over the R15? The plastic panels for one. The lack of fairing and flyscreen should save costs. Then there are the twin LED headlamps. We do not expect the MT-15’s single LED projector headlamp to cost more than the R15’s twin LED headlamp setup so more money saved there. Of course, the flimsier plastics and switchgear should save more money. The major cost-cutting should come in the form of the box-section swingarm and a single-channel ABS. The fact that despite glaring cost-cutting measures, the MT-15 is just Rs 3,350 cheaper than the R15 makes it very hard to recommend the naked bike over the faired one. One issue we have with the R15 is its unforgiving riding position but if you are willing to bear it there is no better entry-level sportsbike than the R15. But if a comfortable riding position is one of your primary criteria for buying a naked bike, there are a lot of other bikes you can look at for the price of an MT15.